(NICOLE PERLROTH New York Times) The antivirus industry has a dirty little secret: its products are often not very good at stopping viruses. 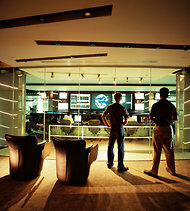 Security experts at the Symantec Security Operation Center in Alexandria, Va. The word “antivirus” is less used on its products. Seculert, an Israeli start-up, approaches the problem somewhat differently. It looks at where threats are coming from — the command and control centers used to coordinate attacks — to give governments and businesses an early warning system. As the number of prominent online attacks rises, analysts and venture capitalists are betting that corporate spending patterns will change. Companies have started working from the assumption that they will be hacked, Mr. Hochmuth said, and that when they are, they will need top-notch cleanup crews. Mandiant, which specializes in data forensics and responding to breaches, has received $70 million from Kleiner Perkins and One Equity Partners, JPMorgan Chase’s private investment arm.